In the last months many migrants are continuing to arrive on the Greek Island of Kos from Turkey, whose coast is about 5 kilometers distant. They pay smugglers from 700 to 2000 dollars for their sea trip to Europe. The Island of Kos has recently seen a drop in tourist numbers which has been attributed to negative reports on the migrant crisis that is continuing to grip the area. 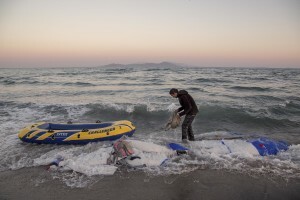 The Aegean sea has become the new entrance door to Europe for them. Around 30,000 migrants have entered Greece so far in 2015, with the country calling for more help from its European Union counterparts. 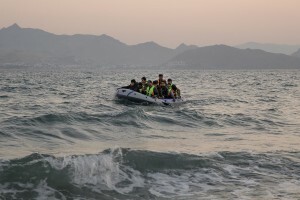 A group of Pakistani migrants arrive on the beach in a dinghy at dawn after making their way from Turkey in Kos island, Greece on June 14, 2015. Many migrants are continuing to arrive on the Greek Island of Kos from Turkey. The Island has recently seen a drop in tourist numbers which has been attributed to negative reports on the migrant crisis that is continuing to grip the area. Around 30,000 migrants have entered Greece so far in 2015, with the country calling for more help from its European Union counterparts. 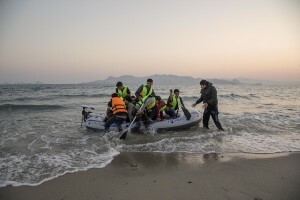 A group of Pakistani migrants arrive on the beach in a dinghy at dawn after making their way from Turkey in Kos island, Greece on June 15, 2015. Many migrants are continuing to arrive on the Greek Island of Kos from Turkey. The Island has recently seen a drop in tourist numbers which has been attributed to negative reports on the migrant crisis that is continuing to grip the area. Around 30,000 migrants have entered Greece so far in 2015, with the country calling for more help from its European Union counterparts. 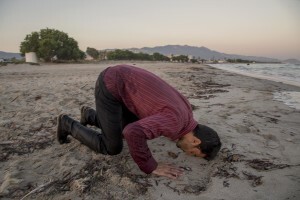 A Pakistani migrant prays after arriving on the beach in a dinghy at dawn after making his way from Turkey in Kos island, Greece on June 15, 2015. Many migrants are continuing to arrive on the Greek Island of Kos from Turkey. The Island has recently seen a drop in tourist numbers which has been attributed to negative reports on the migrant crisis that is continuing to grip the area. Around 30,000 migrants have entered Greece so far in 2015, with the country calling for more help from its European Union counterparts. Pakistani migrants are seen in an abandoned hotel where many migrants sleep in Kos island, Greece on June 15, 2015. Many migrants are continuing to arrive on the Greek Island of Kos from Turkey. The Island has recently seen a drop in tourist numbers which has been attributed to negative reports on the migrant crisis that is continuing to grip the area. Around 30,000 migrants have entered Greece so far in 2015, with the country calling for more help from its European Union counterparts. 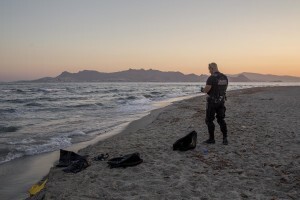 A policeman controls a beach after the arrival from the sea of Pakistani migrants in Kos island, Greece on June 15, 2015. 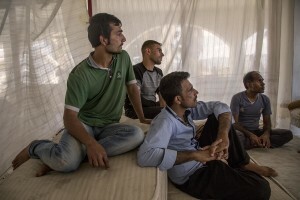 Pakistani migrants rest in a tent near an abandoned hotel where many migrants sleep in Kos island, Greece on June 8, 2015. Many migrants are continuing to arrive on the Greek Island of Kos from Turkey. The Island has recently seen a drop in tourist numbers which has been attributed to negative reports on the migrant crisis that is continuing to grip the area. Around 30,000 migrants have entered Greece so far in 2015, with the country calling for more help from its European Union counterparts. 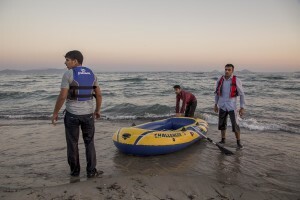 A Pakistani migrant arrives on the beach in a dinghy at dawn after making his way from Turkey in Kos island, Greece on June 15, 2015. Many migrants are continuing to arrive on the Greek Island of Kos from Turkey. The Island has recently seen a drop in tourist numbers which has been attributed to negative reports on the migrant crisis that is continuing to grip the area. Around 30,000 migrants have entered Greece so far in 2015, with the country calling for more help from its European Union counterparts. 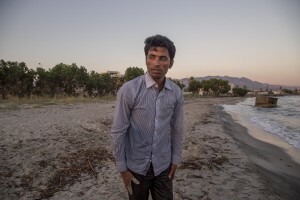 A Pakistani migrant arrives on the beach in a dinghy at dawn after making his way from Turkey to Kos island, Greece on June 15, 2015. Many migrants are continuing to arrive on the Greek Island of Kos from Turkey. The Island has recently seen a drop in tourist numbers which has been attributed to negative reports on the migrant crisis that is continuing to grip the area. Around 30,000 migrants have entered Greece so far in 2015, with the country calling for more help from its European Union counterparts. 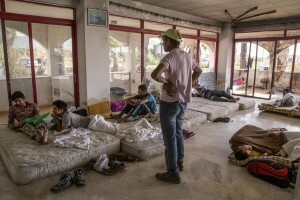 Afghans migrants rests in an abandoned hotel where many migrants sleep in Kos island, Greece on June 8, 2015. Many migrants are continuing to arrive on the Greek Island of Kos from Turkey. The Island has recently seen a drop in tourist numbers which has been attributed to negative reports on the migrant crisis that is continuing to grip the area. Around 30,000 migrants have entered Greece so far in 2015, with the country calling for more help from its European Union counterparts. 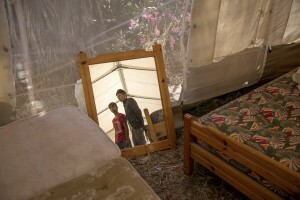 Pakistani migrants are reflected in a mirror inside a tent near an abandoned hotel where many migrants sleep in Kos island, Greece on June 8, 2015. Many migrants are continuing to arrive on the Greek Island of Kos from Turkey. The Island has recently seen a drop in tourist numbers which has been attributed to negative reports on the migrant crisis that is continuing to grip the area. Around 30,000 migrants have entered Greece so far in 2015, with the country calling for more help from its European Union counterparts. 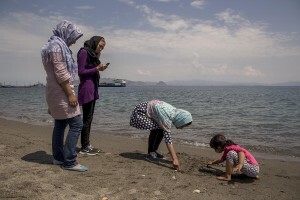 A migrant family from Syria play on a beach near the port in Kos island, Greece on June 8, 2015. Hundreds of migrants are continuing to arrive on the Greek Island from Turkey. The island has recently seen a drop in tourist numbers which has been attributed to negative reports on the migrant crisis that is continuing to grip the area. Around 30,000 migrants have entered the country so far this year, with the government calling for more help from its European Union counterparts. A Syrian migrant consults a map after being caught by the Greek Coast Guard teams in Kos island, Greece on June 14, 2015. 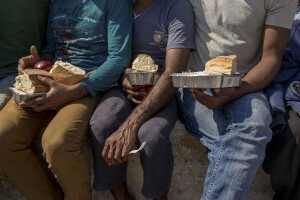 Migrants from Afghanistan, Pakistan and Syria are seen after getting food aid outside an abandoned hotel where many migrants sleep in Kos island, Greece on June 10, 2015. Many migrants are continuing to arrive on the Greek Island of Kos from Turkey. The Island has recently seen a drop in tourist numbers which has been attributed to negative reports on the migrant crisis that is continuing to grip the area. Around 30,000 migrants have entered Greece so far in 2015, with the country calling for more help from its European Union counterparts. An afghan migrant smokes outside an abandoned hotel where many migrants sleep in Kos island, Greece on June 8, 2015. Many migrants are continuing to arrive on the Greek Island of Kos from Turkey. The Island has recently seen a drop in tourist numbers which has been attributed to negative reports on the migrant crisis that is continuing to grip the area. Around 30,000 migrants have entered Greece so far in 2015, with the country calling for more help from its European Union counterparts. Migrants from Pakistan are seen inside an abandoned hotel where many migrants sleep in Kos island, Greece on June 10, 2015. Many migrants are continuing to arrive on the Greek Island of Kos from Turkey. The Island has recently seen a drop in tourist numbers which has been attributed to negative reports on the migrant crisis that is continuing to grip the area. Around 30,000 migrants have entered Greece so far in 2015, with the country calling for more help from its European Union counterparts. 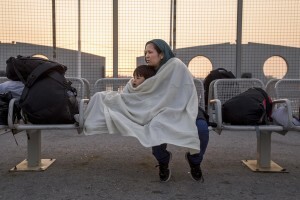 An Afghan woman from the city of Sivas waits with her son to board a ferry bound for Athens in Kos island, greece on June 12, 2015. Many migrants are continuing to arrive on the Greek Island of Kos from Turkey. The Island has recently seen a drop in tourist numbers which has been attributed to negative reports on the migrant crisis that is continuing to grip the area. Around 30,000 migrants have entered Greece so far in 2015, with the country calling for more help from its European Union counterparts. 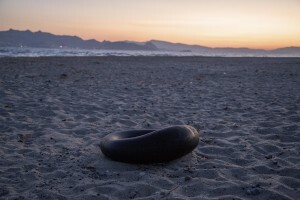 A lifebelt is seen on the beach in Kos island, Greece on June 15, 2015. Many migrants are continuing to arrive on the Greek Island of Kos from Turkey. The Island has recently seen a drop in tourist numbers which has been attributed to negative reports on the migrant crisis that is continuing to grip the area. Around 30,000 migrants have entered Greece so far in 2015, with the country calling for more help from its European Union counterparts.